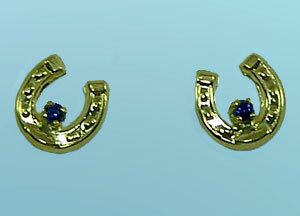 Horseshoe earrings set with matching sapphires. Gorgeous Horse, your number one spot for custom equine jewelry. Check out these cute little horseshoe earrings set with genuine diamond cut sapphires. Would make a great gift for any horse enthusiast. Set with .04 carot of natural sapphire. Customize your pair today with any birth stone of your choice today by using the request box below.